Vanguard Group Inc. is luring more money this quarter than any rivals in the ultra-competitive U.S. market for exchange-traded funds. The US$5 trillion asset manager’s U.S. ETFs absorbed about US$17 billion since year-end, meaning it’s poised to exceed other issuers for the period -- including BlackRock Inc., data compiled by Bloomberg show. BlackRock is in second place with about US$14 billion in U.S. iShares net flows as of March 25, setting up a swap between the two behemoths in the final days of the quarter that hasn’t occurred since 2016, the data show. The duo, which control 65 per cent of the US$3.8 trillion U.S. ETF industry, are locked in a brutal competition for investment in their ETFs. BlackRock, the world’s largest issuer of the products, has almost US$1.5 trillion of assets in its U.S. iShares ETFs. Vanguard is a formidable runner-up, with about US$958 billion. “This is still a largely two horse dominant race in terms of assets,” said Todd Rosenbluth, director of ETF research at CFRA. BlackRock’s net intake so far this quarter was hurt by a US$6.9 billion outflow from its iShares Core S&P 500 ETF on Jan. 25, data compiled by Bloomberg show. Large equity ETFs often see outflows early in the year as advisers seek to minimize client tax bills, according to an analysis from Bloomberg Intelligence. The firm has led U.S. inflows in both February and March. BlackRock spokesman Ed Sweeney said that iShares gathered more than US$28 billion globally in net inflows through March 22. “iShares has consistently led the market in some of the fastest growing segments, including fixed-income, sustainable and factors ETFs,” Sweeney said. The majority of Vanguard’s ETF flows are concentrated in the U.S. “Advisers have long gravitated to Vanguard’s ETFs for their low cost, tight tracking, and brand appeal,” said Freddy Martino, a spokesman for Vanguard, in a statement. Vanguard said it would cut the fee on three of its most popular products earlier this month, just days after trimming the cost of another 10 funds. Its S&P 500-focused ETF is now the cheapest in the U.S., while a bond fund is the lowest-cost fixed-income strategy. Cost cutting seems to resonate with investors. A record 97 per cent of net flows into passive funds in 2018 went to products that charged US$2 or less for every US$1,000 invested. That’s prompted some issuers to waive fees altogether this year. But generating revenue from increasingly cheap ETFs has become a growing challenge. Both BlackRock and Vanguard have in recent years unveiled new funds focused on environmental, social and governance criteria, as well as factors -- products that typically charge higher fees. 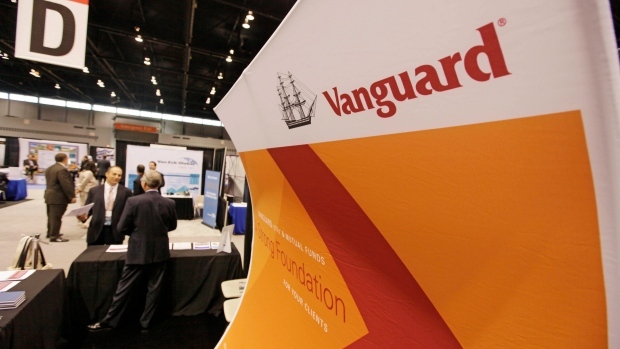 The appetite for lower costs could ultimately boost Vanguard even more going forward. Driven in part by its willingness to slash fees, Vanguard is likely to surpass BlackRock as the world’s largest asset manager within 10 years, or sooner in the case of a dramatic stock market rout, according to Bloomberg Intelligence analyst Eric Balchunas.